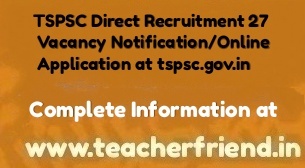 Telangana 27 Vacancies Direct Recruitment Notification for the job of Telangana Horticulture Officer in Agriculture and cooperation department Direct Recruitment Notification/Online Application at tspsc.gov.in/ Telangana Horticulture Officer in Agriculture and cooperation department Direct Recruitment Job Notification/Online Application/How to Applying online application Step by step Process and Important Scheduled Dates Instructions to the Candidates Information at tspsc.gov.in. Application to be made available on Commission’s WEBSITE (www.tspsc.gov.in) to the post of HorticultureOfficer in Agriculture and Cooperation Department. reserves the right to conduct the Examination either COMPUTER BASED RECRUITMENT TEST(CBRT) or OFFLINE OMR based Examination of objective type. Community/ Caste Certificate/ Non-Creamy Layer Certificate in case of BC’s obtained from Mee Seva/ E Seva i.e., Enrollment number and date of issue for uploading in OTR. The numbers of vacancies are subject to variation on intimation being received from the appointing authority, before the last date for submission of Online applications. Get Download ANM/MPHA(F) Notification Click Here.